As Ryan Blaney and the Motorcraft/Quick Lane team head to Martinsville Speedway for the first race of the Round of Eight in the Monster Energy Cup playoffs, they’re hoping the good times continue to roll. Not only have Blaney and his Wood Brothers team excelled on the track this year – from winning a pole at Kansas, a race at Pocono and making it into the third round of the playoffs – they’ve had fun getting there. Blaney said he and his team have a good working relationship, and that extends to their personal dealings as well. From his first days with the sport’s oldest continuously operating team, Blaney has had an appreciation for the Wood Brothers’ history and heritage. 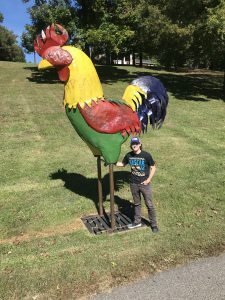 Blaney often wears retro team shirts, caps and even firesuits, but he also appreciates the whimsical side of the organization as evidenced by his wearing of caps featuring the Rhody Creek Rooster. He even paused for a photo with the giant metal bird on a recent trip to Stuart, Va., the Woods’ long-time home. The rooster resides in the front yard of team co-owner Eddie Wood after Wood’s son Jon challenged the team’s Twitter followers to post 2,000 retweets of a photo of the bird, apparently not realizing the strength and enthusiasm of the team’s social media following. As the Motorcraft/Quick Lane team prepared to continue its title quest this weekend at Martinsville Speedway, the home track of the Wood Brothers, Blaney and crew chief Jeremy Bullins, the faithful will gather in Stuart on Friday afternoon. 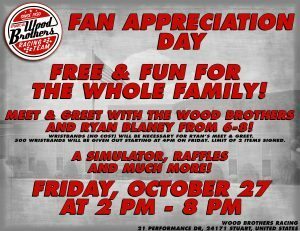 Blaney will be among those celebrating the past and the present as the Woods host a Fan Appreciation Day at the team’s museum. The event runs from 2-8 p.m., and Blaney and the Wood Brothers will host a Meet and Greet from 6-8 p.m.
Eddie Wood said events like the Fan Appreciation Day show that both the Motorcraft/Quick Lane team and Blaney are savoring their success and not letting the pressure of the playoffs turn racing into a chore. Wood added that the fact that Blaney and the team are enjoying the ride shouldn’t take away from the fact that it’s taken a lot of hard work by a lot of people to get this far in the playoffs. Qualifying for the First Data 500 at Martinsville Speedway is set for 12:05 p.m. on Sunday, and the race is scheduled to get the green flag just after 3 p.m. with TV coverage of both qualifying and the race on NBCSN.